Residential housing for low-income people receiving hospice care. Sarah House Santa Barbara is a beautiful eight-bedroom home for low-income men and women receiving hospice care. 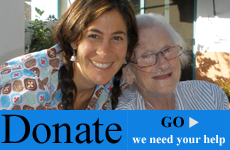 We provide a home and loving care to those facing end-of-life. We also provide care to those living with HIV/AIDS, whether they are at the end of their lives or they simply need a home for regaining health. Our mission is to provide care to those in need regardless of their ability to pay. We offer 24-hour care personally tailored to individual needs. Our services include private bedrooms in a shared living environment; nutritious, home-cooked meals; and assistance in an atmosphere of unconditional kindness and comfort. Additionally, Sarah House Staff offers loving support to family and friends of residents. Partnering with local hospice providers, we integrate high-quality medical care into our warm home setting. We attempt to satisfy each individual’s physical, spiritual, and emotional needs to the best of our ability. Residents, as well as family members, may have confidence that their stay at Sarah House will be marked by genuine compassion and faithful services.